What makes you laugh? More important, what makes your friends laugh? Each round, you'll have two minutes to create funny answers for a randomly generated riddle. But know your audience: One player will be judging answers instead of writing them! The judge's choices for the two best answers earn points. When the game's over, tally up your points to see who's the life of the party. Why Did the Chicken...? is a party game for 4 to 8 players, ages 12 and up. Each game lasts 30â€“60 minutes, but we hope when it ends you will want to . . . play again! I have to start this review by stating that Iâ€™m hopelessly biased toward this game. I had a hand in its early development as the designer, Kory Heath, and I worked on the first prototype together last summer. Iâ€™ve carried what became â€œmy version of Why Did the Chickenâ€� with me ever since then. Itâ€™s provided many hours of entertainment with a number of groups. At the end of last year, I picked it as â€œthe best prototype I played in 2003 that had yet to be publishedâ€� for Fair Play Gameâ€™s year-end picks. Consequently, I was very excited to hear early this year that Koryâ€™s version of the game would be published by the new company, Play Again Games. I quickly got my hands on a copy and I gave it a try with a few groups. In a nutshell, this is a game of generating semi-random riddles and trying to come up with funny or clever answers. One player takes on the role of judge each round and he will pick his two favorite answers from among those offered by the other players. The rules fit on one side of a three-quarter sheet of paper. Itâ€™s that simple, but it offers so much. Colorful nouns and some great starter questions open the door for creative self-expression, surprises and a ton of laughs. When it comes to games in a social setting, I canâ€™t imagine what more you could ask for. Many times the order wonâ€™t change the question much, but even so, with 20 question cards and about 300 noun cards, that makes for well over 850,000 possible questions. As soon as the riddle is read to the other players, they get two minutes (sand timer included) to write down as many answers to the riddle as they choose. If thereâ€™s any drawback to this game, this is where it will become evident. It requires some creativity and some people may feel their answers are too inadequate. I can say from experience that, by far, most players Iâ€™ve introduced this game to have enjoyed it immensely. Iâ€™ve been surprised that some people who I thought would hate it loved it. Others who were initially cold to it warmed up to it and have even won. As an aside, some may wonder how I can feel so confident about this game so soon after it's been released. So, I should mention the only difference between Why Did the Chicken...? and the game I've been playing the last half year is this idea of the two-minute timer and the opportunity to submit multiple answers. It turns out this is a great addition to the game. So, while most of my experience with the game has been with an early version, I can say with confidence that the published version offers much improvement in gameplay. When the timer runs out, all submitted answers are read aloud by one player. The judge considers them and picks his favorite two. The players who submitted those responses take one of the noun cards. Of course, since players may submit multiple answers, itâ€™s possible that a player will get both cards. Cards count as points at the end of the game. We usually play until everyone has been the judge three times. 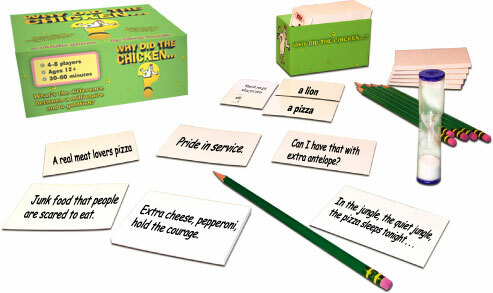 Why Did the Chicken is a great party game that encourages and strectches the imagination. If you are a creative type that likes creative games - then this one if for you. Regular customers who read my interviews and newsletter articles know that I participate in an annual game designers convention called Protospiel. The gathering was first started in 2001 by Stephen Glenn (designer of Balloon Cup). Last year, two days before setting off to Protospiel 2003, I was browsing some websites and I came across the design notes for a game called Zendo. Kory Heath, the game's designer, had recorded his experiences from the earliest concepts of the game to its final published version. Rather than skimming his extremely detailed notes, I found myself reading every word, fascinated at how seriously he took the process of game design. To him, it was a journey of discovery. He spoke of the process with an appreciation that I've felt myself, but that I rarely find in other designers. I immediately wanted to talk to Kory, if not in person, at least by email. I wrote him right away and, thinking the 2003 event was too short of notice, asked if he'd consider coming to Protospiel in 2004. Almost immediately I received a reply. It turns out he was online, planning out his trip to the event two days away! So, I met Kory a couple days later in East Lansing, MI and we spent much of the next four days discussing our games and the art of game design. As I suspected from reading the information at his website, he's a very talented artist. I enjoyed all of his games that I had a chance to play. His suggestions and philosophy have had a clear impact on my own designs. Besides the influence Kory has had on me, I'm convinced we'll see many more great new games from him in the years ahead. I'm glad to be able to offer a few insights into his thoughts and style at this early point in his career. Mike Petty: Kory, I'm glad we've got this chance to do an interview. Could you start off by telling us a little about yourself? Kory Heath: I'm a 33-year old ex-computer programmer from San Jose, CA. I taught myself how to program computers when I was in elementary school and I was lured into the Silicon Valley working world before I had a chance to finish college. In late 1999 I quit my job, moved to Maryland, and am now living the life of a starving game designer. You can only pull this off if you've saved up a lot of money beforehand. Trust me. MP: And how long have you been designing games? KH: It's been about five years now. In early 1999 I started working on my first real design - an Icehouse game called Pantopia. (I haven't finished that one, and I probably never will.) About a year later, I moved to Maryland and embarked on a crazy spree of Icehouse game design, along with John Cooper, Jacob Davenport, and Kristin Matherly. This continued until the publication of Looney Labs' book "Playing With Pyramids" in early 2002. After a period of burnout, I changed my focus to designing German-style games, and that's what I've been doing ever since. Like most game designers, I really got started when I was just a kid. I remember I had a deck of "monster cards" that I cut out of a book, and I invented all sorts of games to play with them. I also remember using hundreds of playing cards to create free-form, abstract adventure games. (I wasn't allowed to play "satanic" games like D&D, so I had to invent my own!) I would create castles, mazes, dungeons, treasure-chests, and monsters out of face-down cards, and I had all sorts of rules about how to travel around, how to collect keys for the different castles and treasure-chests, how to collect weapons and armor for the different monsters, and so on. I played these games by myself, but I imagined that they could be played with multiple players as well. When I got older, the lure of computers and computer games snared me, and I drifted away from board games. However, sometime during high-school I discovered Sid Sackson's book "A Gamut of Games", which planted the notion that grown-ups could design games, too. However, that seed lay dormant until the late 90s, when I finally discovered the world of German games. MP: When you're not working on your own designs, what are some games you most enjoy playing? KH: My favorite three-plus player games are Knizia's Ra and Kramer's Daytona 500. They're both filled with agonizing decisions, and have a superb mix of chance and skill. My favorite two-player game is Knizia's Lord of the Rings: the Confrontation. It's a bit rules heavy for my taste, but the gameplay is extremely compelling. More than most other strategy games, it creates a strong sense of unfolding narrative - each game is like a little story. I'm amazed by how well Knizia managed to balance the unequal forces. I enjoy many of the lighter Knizias - Kingdoms, Quandary, Lost Cities, Schotten-Totten, Tutankhamen, Royal Turf. These games all exhibit a mathematical elegance, coupled with a dose of chance which keeps them from being too dry. Some of Leo Colovini's designs, like Cartegena and Carolus Magnus, also come to mind in this regard. Two of my favorite card games are Mamma Mia and Klunker, both by Uwe Rosenberg. These designs are extremely clever and highly underrated. I've probably played more games of Klunker than of any other game in existence. Some games are favorites only after modification. I love Kramer's Expedition, but I think the official rules are completely broken, so I play with a much-altered ruleset. Knizia's Modern Art is terrific, but I think those double auction cards really screw up the balance. I've spent many enjoyable hours playing Carcassonne, but there are lots of little things about the ruleset that bug me. Werewolf is one of the best games ever designed, although I find it so intense that I usually can't handle playing it. My favorite party game is Dictionary (a.k.a. Balderdash). My favorite traditional game is Backgammon. MP: Before I knew anything about your games, I heard you speak at a session at Origins about simplicity in game design. You were on a panel with several other folks from Looney Labs. What is your relationship with them? KH: My business relationship with them is a standard designer/publisher relationship. They've licensed the right to publish a boxed set of Zendo, and they've licensed the right to publish the rules to a few of my games in Playing With Pyramids. However, it's not all business; I'm also good friends with them. In fact, I moved all the way across the country just to hang out with them and their game-designing cohorts! Almost every week I go to their house (called "Wunderland" by the insiders) to hang out and play games. The people who help me playtest my new designs nowadays-John Cooper, Jacob Davenport, Kristin Matherly, Dave Chalker, Liam Bryan-are all people I met through the Looneys. MP: What's your main motivation behind your game designs? KH: I have two motivations: to create something fun and to create something beautiful. Fun: When I sit down to write ideas into my game journal, I always start by asking myself, "What game do I really want to play right now, but can't, because it doesn't exist yet?" My goal is to envision and then create a game that I myself would love to play. Zendo was like this. I was itching to play an inductive logic game using configurations of small colored objects. No such game existed, so I had to invent one. Beautiful: When I'm designing a game, I'm not just trying to create a fun set of rules. I'm trying to create a finely balanced mathematical sculpture, a glittering, perfect gem. I take great pleasure in contemplating the elegance and colorfulness of games like Royal Turf, Cartegena, and Daytona 500. I want to create games that exhibit this kind of beauty. MP: You mentioned Zendo a moment ago, and I imagine that's where most gamers will recognize your name from. I know you have detailed design notes for that game at your website, but could you tell us a little about how you got started with that game? KH: I got started with Zendo way back in high school, but I didn't know it until much later. Someone showed me a little game where you repeatedly set up configurations of five pencils, and have to guess what number, from 0-5, each configuration represents. That "game" turned out to be a kind of trick, but it left me wondering how it might work if it wasn't a trick. Later, I read about Eleusis in one of Martin Gardner's books. I was fascinated, but also somehow unsatisfied; I wanted something less mathematical and more visceral - something more like the Five Pencils game. Later, I read about Bongard Problems in Douglas Hofstadter's Gödel, Escher, Bach, and thought, "that's more like it". Much, much later, I discovered the Icehouse pieces, and realized that they were perfect for the game I'd been imaging all those years. MP: Zendo was, in my opinion, one of the most original games released in 2003 and I love the attention it gets when I'm playing it with a group of people. It can be quite a heavy thinking game, but almost everyone who plays it really enjoys it. KH: Thanks! I've found that it goes over surprisingly well with non-gamers, if you stick to simple rules. MP: Do you remember a particularly great rule you or someone else used in a game of Zendo? KH: One of my favorite Zendo experiences happened at Origins 2002. Jacob Davenport was the Master, and we were using Mike Sugarbaker's giant foam Icehouse pieces. Because the pieces really grip each other, we had a bunch of koans set up in bizarre, gravity-defying configurations that you could never set up with the ordinary plastic pieces. We were having trouble solving the rule, and at some point Kristin Matherly came by and said, "I can't focus on these giant pieces - I'm going to set this up with the plastic pieces." After a minute, she said, "Hey, some of these koans don't work with the plastic pieces. In fact, none of the white koans do, but all of the black ones do." There was a moment of stunned silence, and then we all burst out laughing. That was the answer, of course! MP: What was the most difficult rule you've seen a master use? KH: There are too many to list! It's really easy to come up with absurdly difficult rules, and they're usually not fun to play. Perhaps the craziest one I've ever heard of is: "A koan has the Buddha nature if and only if the koan consists of a single stack of four pieces representing a Bridge trick which is won by the third card. The top piece represents the lead card, the second piece down represents the second card, etc. Red is trump." MP: That sounds like a good way to burn about three hours of gaming time! As much as I enjoy the game, I find the most basic rules give me a more than sufficient mental workout! We keep it pretty simple when we play. You and I met last year at Protospiel and I enjoyed our discussions about the art of game design. Even your answers here remind me how seriously you take it. What's your favorite part of the design process? KH: That's a tough one, because I love just about every part of it! I love jotting down the initial ideas in my journal, mulling them over, working up initial rulesets, making prototypes, playtesting for months, writing up the rules - I love it all. I guess if I had to pick a favorite thing about game design, it would be the thrill that I get when I come up with a beautiful, elegant solution to a knotty design problem. It's especially fascinating to explore the unexpected emergent effects that these fixes always seem to generate. This kind of thing makes game design feel more like exploration and discovery than creation. MP: What part do you like the least? KH: The thing I like least about game design is having to wait around for the next opportunity to playtest. I almost always come away from a playtesting session bubbling with ideas, and usually within 24 hours I know exactly what I want to try next and have made any necessary changes to the prototype. Unfortunately, I often have to wait days or even weeks before I get another opportunity to playtest that game. Compared to some designers, I'm actually extremely fortunate in this regard - I have two regular game nights a week, and I have terrific friends who are always willing to playtest my stuff. Nevertheless, the list of new things to try is always growing faster than the time I have available. In an ideal world, I would playtest six or seven nights a week - as I understand Knizia does. This, by the way, is one of the reasons why I'm such a big fan of Protospiel. We designers are always desperate for more playtesting, so the idea of an entire weekend devoted to it is heaven. MP: Yes, and the fact that most those doing the playtesting are also designers makes it even better! I played a few of your designs at Protospiel last year. One of them is now being published and will be in stores shortly. While Zendo is a pretty serious game, this new game is quite different. Can you tell us about that one? KH: Sure! It's called "Why Did the Chicken...? ", and it's a party game - something I never expected to design! It's being published by a new company called Play Again Games, and it should be available by the time this interview hits the web. I love games which allow players to be truly creative, which is why Balderdash is my favorite party game. However, in each new round of Balderdash, I find that the first answer I come up with is a funny one, not a serious one. I'm always tempted to write down the funny one and go for the laugh, but this is a sure way to lose the game. There's a direct conflict between being funny and playing to win. So my goal with "Why Did the Chicken...?" was to create a game in which being funny and playing to win are the exact same thing. MP: You know I've been particularly interested in the development of this game ever since we started talking about the core concept last year. I can't wait to try the final version! KH: Thanks! I should point out to our readers that you were instrumental in the early design of this game. I came to Protospiel with an idea about finding analogies between random nouns and you came to Protospiel with an idea about inserting player's names into funny questions. Eventually this evolved into the idea of answering riddles formed from the juxtaposition of random nouns and you helped a lot with the early playtesting and brainstorming. Thanks so much for helping me with this project! MP: It certainly was my pleasure. Playtesting the game has always been a hilarious experience. I still crack up with I remember that first playtest at Protospiel when we had the question "What's the most boring title for a movie?". Dave Chalker's response: "Film: The Movie". I felt it was one of the best games we played last summer and I'm glad it's being published. What's the best question and answer you can remember from one of your sessions with the final version of the game? Q: What happened when a lawyer went on a blind date with a cow? A: "You looked better in your picture," said the cow. Q: What do a marshmallow and an artichoke have in common? A: They both have these really cool mascot characters. Marshmallows have the Stay Puft Marshmallow Man, and artichokes have, like, Chokey the Green Chokey Guy. MP: Ah, yes, that sounds like the game in all its glory! I love how it takes on a certain character depending on the group you're playing with. KH: I should point out that Why Did the Chicken is one of the first in what will hopefully become a long list of published games which have seen their inception at Protospiel. MP: I can think of four games offhand that I've seen playtested at Protospiel that are published or being published. While I don't think there's anything magical about the event itself, I believe the attendees take game design very seriously. The information, encouragement and contacts found there are invaluable to designers at all levels. While we're on the subject, Protospiel 2004 will be in East Lansing, Michigan again this summer. In fact, you're scheduled to do a couple seminars this year. Assuming some people reading this might be interested in attending, what are you planning on talking about? KH: I've been mulling over some theoretical ideas about the relationship between theme and mechanics in boardgames, so I'll definitely be talking about that. That should be fun, since there's likely to be some disagreement - and maybe even a good old-fashioned brawl! I'm also planning to give a talk outlining some of the most common game design problems I've encountered like kingmaker, petty diplomacy, etc., and some thoughts about how to go about solving them. MP: I'm looking forward to sitting in those sessions and talking with you again in June. Thanks for taking the time to do this interview. KH: It's been a pleasure! Looking forward to seeing you at Protospiel. Both Zendo and Why Did the Chicken...? are available at Fair Play Games.